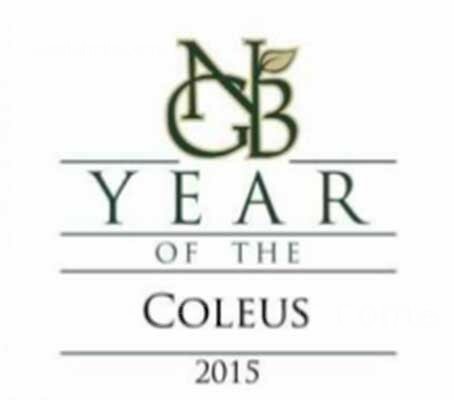 Coleus has enjoyed a resurgence in popularity over the past few years. The new breeding has taken a handful of series and exploded them into hundreds of wild and crazy types of colours and forms. Overwhelmingly the favourite is Kong for its sheer presence. Grown for its outstanding foliage colours, the Kong series of coleus boasts extremely large leaves with irregular edges, each leaf is easily as big as your palm, and probably twice as large as the next biggest Coleus you can buy. Kong 'Mosaic' displays unique leaf patterns of bright green, shades of red and cream, no two leaves are alike. It is great for large containers and shady mass plantings and performs best and shows the most intense colour in full shade. The well-branched plants grow 45 to 55cm (18 to 22in) tall in the garden, with a spread of around 38 to 45in (15 to 18in). Coleus are easy-to-grow, low-maintenance plants that are almost fool proof when grown in well-drained soil and watered through periods of drought. They are also excellent in baskets, especially when grown in combination with a vining or cascading plant. Hardy to around 4°C (40°F) these tender perennials also make a good indoor house plant in bright artificial light conditions. Coleus colours become more vibrant when they get more shade. 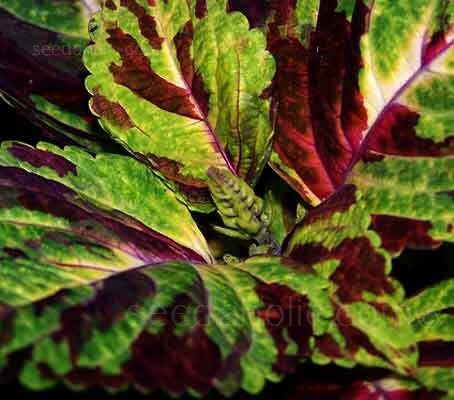 This is very unusual behaviour, and explains why Coleus is a popular choice for under-the-tree plantings and shade-of-the-building gardens. It is also carefree and forgiving. Kept in the shade or partial shade, it is hard to go wrong with this plant. Sow all year round for pot plant . For the garden, sow 10 to 12 weeks before the last expected frost , they will then be well developed when it is time to plant them outdoors. Sow seeds onto a layer of moistened, sterile potting soil in a shallow tray, do not cover as they need light to germinate. Cover with glass or plastic to retain moisture, until the seeds have germinated. Place in a warm (21°C/ 0°F), bright (not full sun) place. When the seedlings are large enough to handle, transplant into individual pots. Seedlings should always be held by a leaf, never by the stem. Pinching is not needed for Coleus Kong: it will result in smaller leaves and delay crop time, but be sure to pick off the flower spikes as they form. Coleus is very durable, so you can cut your plant back severely if needed (almost back to the soil level). Fertilise with a diluted (50% mix) liquid fertiliser, too much feeding with high nitrogen fertilisers, encourages soft growth and poorer quality foliage. Coleus should be kept at a 15 to 20°C (60 to 70°F) over winter. They will survive down to 10°C (50°F) but only if kept dry. Losses to rot and fungal diseases are high if the plants are allowed to get cold and damp. Best in pots as house plants, or in the warmer conservatory, coleus can also be grown in containers or window boxes alongside other temporary summer planting. They can also look good bedded out with salvias, rudbeckias, gaillardias and other late-summer flowers in the red-yellow end of the spectrum in warm borders. The roots of coleus are known from ancient times, where it served as a stand in for Salvia divinorum, in shamanistic rituals. Not much research has been done on the psychoactive chemicals within the plant. The effects resemble those of psilocybin, which is found in psilocybian mushrooms. Two species were in cultivation by the 1860s, Coleus verschaftelti and Coleus blumei, and the first coloured-leaf variety appeared at a Royal Horticultural Society show in June 1861, introduced by William Bull, a nurseryman of King's Road, Chelsea. Seven years later the RHS organised a promotional auction of new hybrids. One plant fetched 59 guineas, expensive now, but in those days was an enormous sum. Meanwhile Bull had bred about 150 varieties, of which he was marketing the best 18, cannily timing new releases to coincide with mentions of the plant in the gardening press. The breeding and propagation of sports was so frenetic that Gardener's Chronicle of 1869 dubbed it 'coleus fever'. Varieties have changed little since then and we're still working with essentially Victorian material. Several years ago, the powers that be changed the name to Solenostemon scutellarioides but in a blatant act of taxonomic defiance, we refuse to call them anything but Coleus. Coleus 'Kong' was originally bred for Ball Horticultural's centennial a few years ago. The series gets its name from its enormous leaf. Supplied as easy-to-sow pelleted seed.